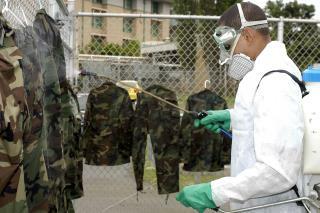 (Newser) – The US military was apparently on to something when it began treating soldiers' uniforms with permethrin in the 1980s. The move was based on tests showing the EPA-registered pesticide, which mimics extracts from the chrysanthemum flower, prevented tick and other insect bites. Three decades later, it still holds up to scrutiny, according to CDC researchers. They let black-legged, lone star, and American dog ticks loose on 10 types of permethrin-treated clothing and saw speedy effects, as described in a recent issue of the Journal of Medical Entomology. Juvenile black-legged ticks died in less than a minute, while others started "rolling" away, researcher Lars Eisen tells NPR. Per American Veterinarian, all ticks saw "loss of normal movement," meaning they were unable to bite, when left in contact with the clothing for up to five minutes. I have spent a lot of time in the woods over the last 20 years. I take garlic tablets, 1 morning and one nightly. I have only had 1 tick during that time. Not saying that the garlic repels all blood suckers but it works for me. Before I started doing this ticks and mosquitoes ate me alive. Prymethrin is the natural one made from the flower. This one is the pesticide chemically made from the flower. The first is used in all commercial kitchens and stuff and the latter is used on farms. I have a whole house misting system and use the natural one. It works great. No clue why you'd use the one not sprayed around food. Time to reevaluate DDT without all of the hysteria.